Passenger aircraft use the spare volume in the airplane's baggage hold (the "belly") that is not being used for passenger luggage—a common practice used by passenger airlines, who additionally transport cargo on scheduled passenger flights. Cargo can also be transported in the passenger cabin as hand-carry by an “on-board courier”. This practice can often be used to cross-subsidise loss-making passenger routes that would otherwise be uneconomical to operate. Cargo aircraft are dedicated for the job—they carry freight on the main deck and in the belly by means of nose-loading or side loading. Combi aircraft carry cargo on part of the main deck, before or after a passengers’ section, with side loading, and in the belly. The world's first official airmail flight by airplane took place on 18 February 1911, at a large exhibition in the United Provinces of Agra and Oudh, British India. The organizer of the aviation display, Sir Walter Windham, was able to secure permission from the postmaster general in India to operate an airmail service in order to generate publicity for the exhibition and to raise money for charity. This first airmail flight was piloted by Henri Pequet, who flew 6,500 letters a distance of 13 km (8.1 mi), from Allahabad to Naini—the nearest station on the Bombay-Calcutta line to the exhibition. The aircraft used was a Humber-Sommer biplane with about fifty horsepower (37 kW), and it made the journey in thirteen minutes. The world's first scheduled airmail post service took place in the United Kingdom between the London suburb of Hendon, and the Postmaster General's office in Windsor, Berkshire, on September 9, 1911. It was part of the celebrations for King George V's coronation and at the suggestion of Sir Walter Windham, who based his proposal on the successful experiment he had overseen in India. The service ran for just under a month, transporting 35 bags of mail in 16 flights. Although there were a few attempts to organize air freight airlines from the 1920s on, the first commercial airlines that were all-cargo did not emerge until after World War II. In 1945, at a conference in Havana, 57 airlines formed the International Air Transport Association. In 1948 Berlin was jointly controlled by the Allies and Russians, although the Russians held the area surrounding the city and thus land access. 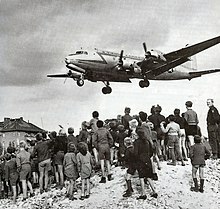 As this access was closed, in the so-called Berlin blockade, an airlift remained the only option to get increasingly urgent deliveries of food, coal, and other supplies to West Berlin. Over 330 days to 12 May 1949 a total of 2.26 million tons of cargo were airlifted to Berlin, an average of 6,800 tons a day, 80% by the US and 20% by the UK. Although freight traffic developed modestly, reaching only 800,000 tonnes worldwide by the mid-1950s, the world economy was hitting its post-war stride. Germany and Japan were emerging from their period of purgatory and were poised to take the world of business by storm, the United States was approaching the height of its economic dominance, and Western Europe had recovered from the war. In 1968, Boeing launched the four engine 747, the first wide-body aircraft. The 747 was the first aircraft capable of transporting full pallets in the cargo hold, revolutionizing the air cargo industry. Despite widespread hopes for a vibrant industry, for decades the air freight did not grow as expected and remained a very small part of total air traffic. For much of the first five post-war decades most carriers saw it as a secondary activity, although there had always been specialized cargo airlines. Some passenger airlines have found the practice of carrying "belly cargo" a highly lucrative enterprise (in fact, it is estimated that 50% of all air freight is moved in this way), to the point where it has lessened the demand for dedicated large cargo aircraft. However, with the exception of the integrators (FedEx, UPS, DHL and TNT) the air cargo industry continues to suffer as the by-product 'poor-relation' of the passenger business. In 2017, the IATA observed a 9% rise in freight tonne kilometers: air cargo demand is strong due to industrial production and global trade growth above expansion of e-commerce, outpacing capacity as available tonne kilometers grew by 3%. Boeing is doubling its 767F production since 2016 to three per month in 2020. 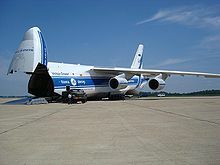 Wikimedia Commons has media related to Air cargo. ^ Johnsson, Julie. "Big-Belly Boeing 777 Blunts Demand for Cargo-Only Jets". Bloomberg. Retrieved 27 June 2014. ^ "eCommerce delivery – What do your customers want?" SEKO Logistics, 22 August 2018. Accessed: 12 February 2019. ^ Randy Tinseth (Apr 26, 2018). "Air Cargo Carries Growth Momentum Into 2018". Boeing.